The voluntary nature of the Scandinavian conversion – in Denmark and Sweden at least – seems to have led to communities feeling that they did not need to significantly alter their artistic communication or abandon their traditional culture in order to be good Christians. C. S. Lewis writes somewhere that one of the best methods of evangelism would be for Christians, not to produce more “Christian” work, but to simply do better work as Christians. From my perspective as an amateur historian, I would say that Martyn and Hannah Whittock (father and daughter) have produced superior historical work in producing The Vikings: From Odin to Christ, published by Lion Books, a Christian publisher. It’s weird for a guy like me, a promoter of the historical value of the Icelandic sagas, to say, but there’s good reason to believe that the story of the conversion of the Vikings, as presented in the sagas, may be misleading. The Whittocks point out – and somehow I’d missed this – that there is little report of violence in the conversions of Denmark and Sweden. Only in Norway, where saga writers had political motivation to glamorize Olaf Haraldsson as Norway’s national hero and saint, do we have stories of torture and threats of death. It may be true that Olaf was a bloody-handed tyrant (I believe that). But his work may not have been as influential in the conversion as the sagas suggest. There’s good reason to think that the earlier Christian king, Haakon the Good, who gets short shrift in the sagas, may have been a far more effective missionary than history remembers. This harmonizes with things I’ve been saying in my lectures for some time. Now, having read the Whittocks’ book, I have more ammunition for those arguments. I’m also delighted that the Whittocks have very clearly read Bishop Fridtjof Birkeli’s untranslated book, Tolf Vintrer Hadde Kristendommen Vært i Norge (which Anders Winroth, for all his expertise, overlooks entirely in his book on the conversion of Scandinavia). I’m delighted that Birkeli’s important ideas, largely unknown to English readers till now, are being conveyed through this book. 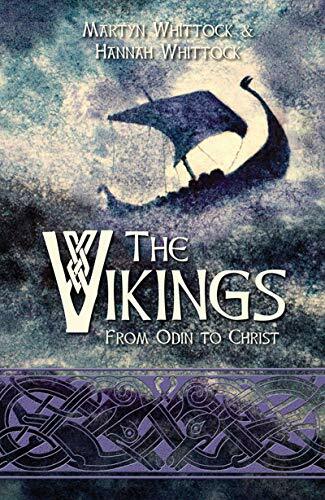 The Vikings: From Odin to Christ covers a lot more than the conversion of Norway, of course. We start with a historical overview, then examine each Scandinavian country in turn, followed by various regions that the Vikings colonized. I have a couple minor quibbles – at one point they suggest St. Olaf’s opposition was motivated by heathenry, but they correct that later on. I haven’t found a history book a page-turner in a long time. The Vikings: From Odin to Christ kept me turning the pages. I recommend it highly.